A weather warning is also in place later tonight due to strong winds. Snowy conditions in Dublin in January. A FROSTY MORNING across the country has let to some perilous road conditions and closures in some areas. A status yellow warning for snow and ice remains in place until 8am this morning with a separate warning for wind and rain due to kick in later today. AA Roadwatch reports that motorists should be wary of icy conditions in many areas, particularly in parts of the west, northwest and northeast of the country. The traffic monitoring service says that gardaí in Donegal are warning motorists that they should avoid Buncrana’s Mountain Pass due to a number of vehicles becoming stuck in the ice. Galway’s N84 and routes around Carrick-on-Shannon have also been particularly hard hit by the cold weather. 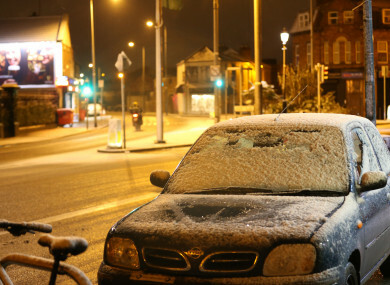 Bus Éireaann has said that a number of different services have already been cancelled due to snow and ice. Irish Rail has yet to announce any cancellations but has said that this morning’s 6.40am service from Limerick to Dublin Heuston has been delayed to icy patches. The weather outlook for the rest of today will see sunny spells across today with scattered showers that will die out throughout the afternoon. This evening’s forecast is a lot worse as heavy rains are predicted across all areas with local flooding with strong and gusty southerly winds. Rain may turn to sleet or snow on higher ground with temperatures dropping to between -3 to 1 degrees celsius overnight. Email “Icy conditions have led to treacherous roads and some bus cancellations this morning ”. Feedback on “Icy conditions have led to treacherous roads and some bus cancellations this morning ”.